It was reported earlier that the filming of Ula is happening in full swing and that the team is busy canning important portions of the film around Chennai city. 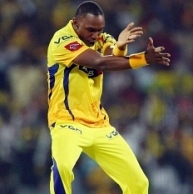 Well, the latest update is that Dwayne Bravo, the multi-talented West Indian allrounder also representing Chennai Super Kings, who is famous for his exciting dance moves whenever a wicket falls, will shake a leg for the film. Bravo had apparently accepted the offer the moment he was approached. The song would be a promotional number that would be filmed some time next week. Ula is directed by Rajan Madhav (Muran fame) and has Vidharth, Ashok (Pidichirukku fame), Ajmal, Radhika Apte, Gayathrie, Priya Banerjee and Nivedita in the lead roles. The film will comprise of a collection of stories that would be hyperlinked in the climax. The music is composed by Sajan Madhav and the camera is handled by Padmesh. Produced by L.V Srikanth, under the banner Dream Productions, the team is looking at releasing the movie by the end of this year. People looking for online information on Dwayne bravo, Ula will find this news story useful.